Different worms attack pine trees, depending on the species and location of the trees. Many worms only cause cosmetic damage by chewing on relatively few needles on a tree, but others can defoliate an entire tree within days. Male bagworms develop into moths while female bagworms crawl or are blown to other areas and build nests. A female bagworm uses twigs, leaves and silk to build a bag, lays eggs in the pinecone-shaped bag and remains there until she dies. Bagworms are shiny black on top and dull amber on the underside when they hatch. Adult bagworms are dull gray with darker markings near their heads and will strip the needles of infested trees. Remove the bags from the trees and spray young bagworms to eliminate them. Adult bagworms are hard to control or destroy. Several species of sawfly larvae feed on pine needles, but generally are not harmful to the tree. Knock sawfly larvae out of the tree or prune infested branches from the tree and kill the worms to control the infestation. 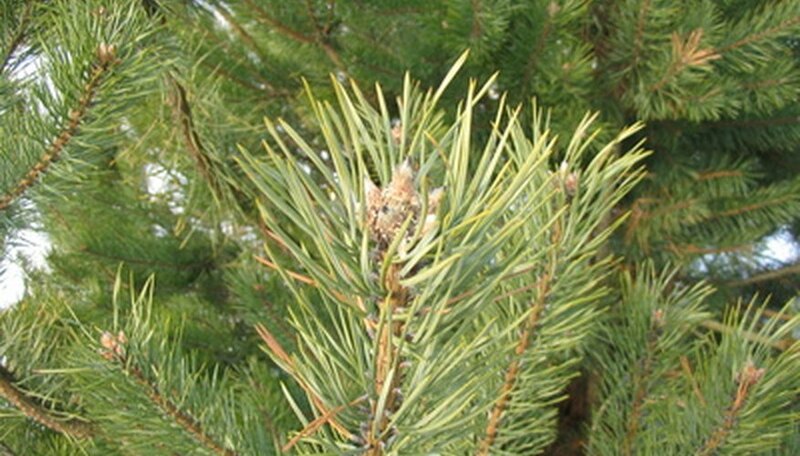 An application of insecticide approved for sawfly larvae on pine trees can be used at the rate recommended by the manufacturer. European pine sawfly larvae have grayish green bodies, a dark stripe and two light stripes on their sides, and shiny black heads and legs. Introduced pine sawfly larvae are grayish with rows of yellow and black spots along their sides. Redheaded pine sawfly larvae have yellowish bodies with brown spots and orange heads. Southern pine beetles lay their eggs on stressed or diseased pine trees. When the larvae hatch, they tunnel under the bark in an “S” pattern. The tunnels destroy the cambium and cause masses of resin, called pitch tubes, on the trunk of the tree. The needles of infested pine trees turn reddish-brown. There is no chemical control of Southern pine beetle larvae, and infected trees should be removed and destroyed.